These tasty turkey legs are slow grilled to perfection and basted in a classic tomato-based barbecue sauce. They are great for any occasion, such as a family dinner, summer parties, and even tailgating. Cook the onions and celery in butter over medium heat until soft, about 7 to 10 minutes. The object is to sweat the vegetables, not saute them. They should have a more glossy appearance rather than browning. Add the remaining sauce ingredients to the pot. Simmer over medium-low heat for 5 minutes, stirring often. Add more brown sugar to make the sauce sweeter. Remove from heat and allow sauce to cool to room temperature. Preheat the grill. Combine salt and black pepper and season the turkey legs. Place turkey legs on grill and cook over a medium heat. Grill, covered for about 30 to 45 minutes or until nearly done. Turn occasionally. Begin basting with sauce during the last 15 to 20 minutes of cook time. Watch out for burning. 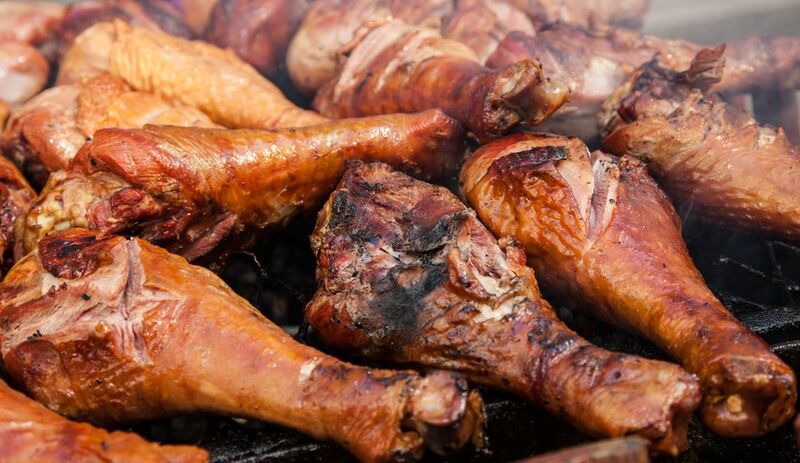 Reduce heat or move turkey legs to indirect portion of the grill to finish cooking. Once legs reach an internal temperature of 180 to 185 F, they're done. Remove from heat and loosely tent with aluminum foil. Let legs rest for 10 minutes before serving. If you want to to serve some of the sauce on the side, simply divide the sauce using one portion for basting and warming the reserved portion for serving. You can also double the sauce recipe if you really want to have quite a bit. The choice is all yours.